The Vigilante I know was Adrian Chase, created by Marv Wolfman and George Pérez, a district attorney fed up with a corrupt judicial system and devastated when his family is killed by the mob decides to take the law into his own hands. It was one of the first "premium format" comics I bought as a young man in the 1980's and I collected the entire run. Written by Wolfman, Paul Kupperberg, and Alan Moore, Vigilante was sort of a blonde-haired Batman, wealthy and motivated by the loss of his family, riding around on a suped-up motorcycle fighting his own rogues' gallery. While Chase may have shared a "no-kill" philosophy like the Dark Knight, it didn't last as his friends began to perish, partly because of his actions as a vigilante, he became more brutal and vicious is serving out justice. He descended into despair and gave up the costume. It was a dark series that at times was controversial for its themes. There were Vigilantes before and after Adrian Chase but that one stuck with me. Fast forward to 2016 and DC Comics is taking another chance on a whole new series with a brand new take on the character. Mystery author Gary Phillips and artist Elena Casagrande introduce Donny, a guy drifting through life, playing pick-up basketball games, smoking weed, and unmotivated by his girlfriend's growing activism. She discovers some secrets that cost her her life leaving Donny to wonder if her death was in fact just a hit and run accident. Now at this point, I was expecting an accelerated jump to Donny finding Dorrie's disguise and taking over her role as a clandestine activist and then as a vigilante. It's headed that way for sure but Phillips is taking his time developing this world and fleshing out the characters. Refreshingly, Phillips resists using popular southern California landmarks to stage his story, instead, he stays true to his character's surroundings in small communities that make up the sprawling Los Angeles area. It shows that Phillips knows the city in ways others haven't been able to convey because he's actually from L.A. It adds a sense of realism and gives the story a wider scope, a larger canvas to cover than just Hollywood or a coast city for example. 'Vigilante Southland' is more of a crime drama, a murder mystery set in a comic about a costumed vigilante. Donny isn't instantly ready to don the mask and hit the streets, he's being groomed with a little help from someone close to him. It's not as cliched as a Master-Pupil relationship but more of a "son, let me show you how it's done," type of attitude that removes Donny from his place of complacency. If you've read the pulpy crime stories from Ed Brubaker and Sean Phillips you get the idea behind the tone of Vigilante. And like Sean Phillips, Elena Casagrande gives the book its own unique gritty appearance. 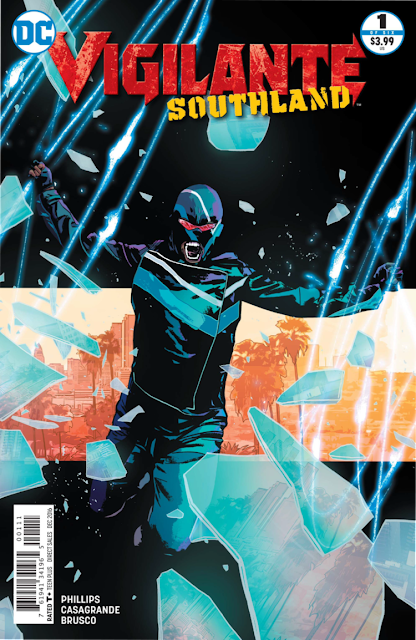 The art of Vigilante and the story for that matter has the pace and look of an indie title. DC Comics appears to have given the creative team plenty of freedom to tell this version of the character in a more deliberate meaningful way. It comes from a different perspective than from the days of Adrian Chase. Having a black writer on a book about a black hero (or anti-hero) lends authenticity to the story and the world he inhabits. It's not diversity for diversity's sake, it's about telling a story through new eyes, eyes that have always been there ready to contribute. 'Vigilante Southland' #1 is the first chapter of what hopefully will be an immersive mystery story full of intrigue, danger, and crime fighting action. We get a taste of the conspiracy aspect of the story in the debut issue as well as Donny's newfound purpose to find justice for Dorrie. It hits some familiar beats but it's only the first step in this reimagined tale of the 'Vigilante' legacy told in a new exciting contemporary way. Don't lose out on this solid debut.